This is a work in progress. Any and all information or picture contributions are welcome. In this article I have attempted to assemble whatever information has been collected so far about W.A. Cole and his younger brother, F.E. Cole and bring it all together in one place. Hopefully, it will provide a good start. William A. Cole, the older of the brothers, was a successful performer and teacher in Boston from before 1880-1909. We first hear of him as a maker when he joined with A.C. Fairbanks as "Fairbanks & Cole" in business together from 1880 to 1890. If he made instruments on his own prior to that, there is no mention in contemporary articles or trade magazines. They split in 1890. Fairbanks stayed at the 187 Tremont Street address where they had moved, and advertised his new company as "The Only Successors of Fairbanks & Cole." Cole established his business at 179 Tremont, (a move which caused some public antagonism between the former partners), where he manufactured mostly banjos as "W.A. Cole, Maker, Boston, Mass." He also made some guitars and mandolins but it is the Eclipse model banjos which are considered to be some of the finest and fanciest banjos ever made. His younger brother, Frank E. Cole, a cabinet maker, supervised most of the production work while William travelled as a performer with the "Imperial Quartet." William died in 1909. Frank retained the "W.A. Cole" name after William's death in 1909. He continued to advertise guitars, mandolins and banjos until he sold the company to Nokes & Nicolai in March, 1922. Frank had agreed to stay on to supervise the operation, but he died in June of that same year. The total output of the W.A. Cole Company's 32 years in business appears to be fewer than 10,000 serial numbered instruments (the highest reported is #8555, a tenor Eclipse). In the early years, 5 string banjos, banjorines, and variants dominated. Around the turn of the century, banjo mandolins proliferated, and by the teens almost all of Cole's output was banjo mandolins and tenors. The guitars seen have been beautifully made, most from Brazilian rosewood with typical Cole style engraved inlays. 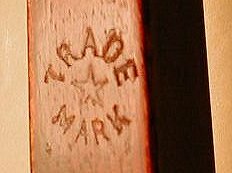 Whether the guitar and mandolin bodies were actually made in the Cole workshop, or purchased elsewhere and decorated there, is not known. Frank Cole's patent for mandolin construction suggests he intended to make them, but no pictures of the workshop have surfaced yet. Few instruments were made in the last years before the sale in March, 1922, but there must have been something worthwhile left to spur the purchase of the company by Nokes & Nicolai. In 1885, William A. Cole was issued one patent, with A.C. Fairbanks, for a peg support. No patent for the tailpiece marked "F&C - Patented Sept. 21, 1886" has been found. 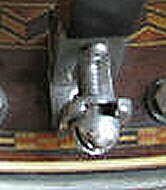 There was a tailpiece patent issued on that date to Frederick H. Hodges, Newport, RI, but it looks quite different. Even so, its design may form the basis for the F&C claim. Click the tailpiece photo for a comparison of the two. 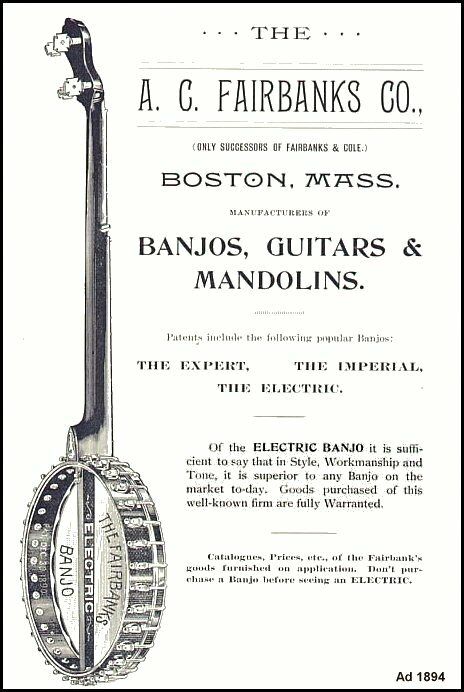 Frank E. Cole received 3 patents, a mandolin in 1891, the Eclipse tone ring in 1894, and one for a banjo bridge in 1899, all of which show up in Cole products and advertisements. 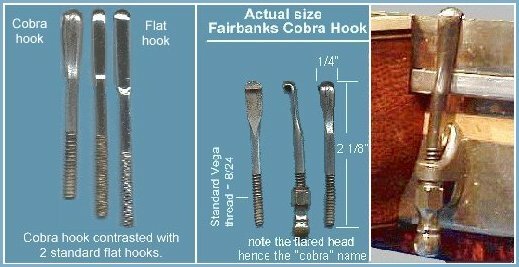 Likewise, no patent issued to Cole has been found for the adjustable neck ferrule seen on higher end instruments, but patent number 457996 issued on 8/18/1891 to Victor Kraske looks to me like it is the one. Both the adjuster and the collar appear on banjos built in the first year Cole was in business alone, 1890, and simply may have come from Kraske's workshop. 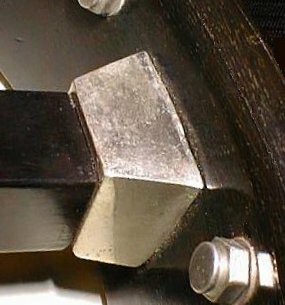 Compare the Cole adjuster to one found on an Imperial banjo on which can be seen the patent date. 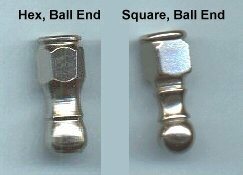 Cole's neck adjuster is found with and without the small set screw that can be seen in the photo; it's not just that it gets lost, there is no hole for it in some adjusters. In 1894, John Barrows (Waldo Mfg. Co.) filed for and was issued a patent for a neck adjuster, but it worked on a different principle. It is not the source of the Cole adjuster as some have suggested. Weymann banjos have been found with neck adjusters on some high end models, but while similar, they are not the Cole adjusters. Instruments marked "Fairbanks & Cole" date from the 1880-1890 partnership. Fairbanks & Cole banjo models were Clipper, Expert, Imperial, and Acme. After the split, they each eventually started over with a new series of serial numbers, probably beginning with 1, although Fairbanks seems to have continued the numbering for a while before starting over. They each produced un-numbered banjos, too. Instruments marked "A.C. Fairbanks" or with ACF's trade mark, plus a wavy "Fairbanks & Cole" stamp are the "Fairbanks & Cole model" made and sold by Fairbanks after the split, presumably to capitalize on the old name. Instruments marked "W.A. Cole" date from 1890 to 1926. When they bought Cole's in 1922, Nokes & Nicolai, primarily drum manufacturers, continued to make banjos and some ukuleles, presumably with the W.A. Cole name, until they, in turn, were bought out in 1926 by the Liberty Musical Instrument Co. of Chicago, IL. W.A. Cole models included Eclipse Banjos, Imperial Mandolins, and Boston Guitars. Each model was sold in a variety of styles and decorations. The Man-In-The-Moon inlay is found on the pegheads of some Eclipse banjos and some Cole guitars, but rarely on instruments labeled for others. Cole made instruments, particularly banjos, and labeled them for other companies to claim. These seem to have serial numbers in the regular order of his own branded banjos. Guitar and mandolin serial numbers are often stamped on the very end of the peghead. They apparently had a separate serial numbering scheme -- the serial numbers on known instruments are too low to correspond to the banjos or be part of a single series. 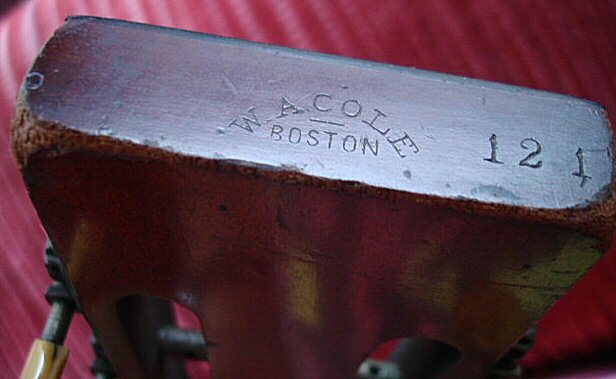 Cole stamped many guitars "1898 Model" even into the 20th century. 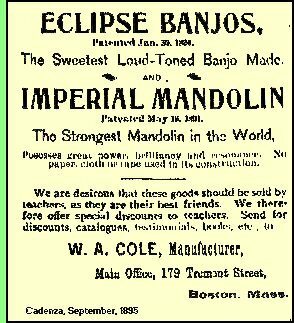 1904 Cole ad showing style 5000 Eclipse and listing Imperial mandolins and Boston guitars. 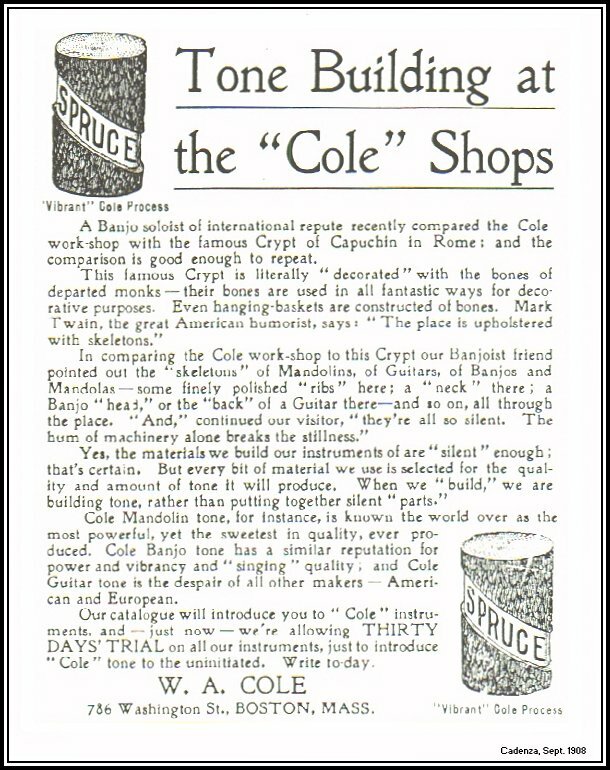 1908 Cole ad comparing the Cole Workshop with the Crypt of Capuchin in Rome. Banjos made by Cole have been seen labeled Charles Bobzin, George Washburn (Lyon & Healey), Stratton & Handley (others were made for them by Haynes), and Superbo (Elias Howe). There are probably others. One circa 1909 Bacon FF Professional has been seen looking very much like the Vega-made models, but this one had Cole hardware -- shoes, nuts, and patent neck attachment yoke. 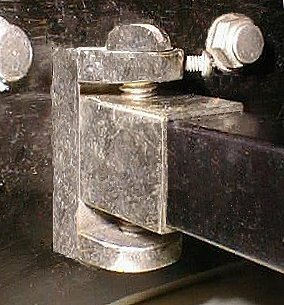 Note: Cole banjo serial numbers are frequently on the top of the strut, on the side towards the head; to see them you must first remove the head or use a mirror. Often the same number is stamped somewhere on the inside of the rim, too. It can be faint, and sometimes it was painted over, making identification even more difficult. Occasionally, the rim number is between the head and the strut. Sometimes there are only 2 digits, which match the last 2 digits of the serial number. Guitar and mandolin serial numbers are generally stamped on the end of the peghead (see above). 11 x 26" earliest reported WAC. Eclipse patent applied for March 30, 1893. Eclipse patent issued to F.E. Cole January 30, 1894. 12"x28" purchased new in 1896. Won as prize in circa TOC. 1 Cole built banjos for other makers. Several "Man-In-The-Moon" models were made special order for Lyon & Healy. Acknowledgements: Thanks to Brian Kimerer, Stacey Zabolotney, and Hank Schwartz for the use of some of their photographs, to Phil Ellis for the Kraske neck adjuster picture, and to Jim Bollman for all his help. More information about Cole, Fairbanks, and others, with a detailed history of the development of the banjo, and some wonderful photographs, can be found in America's Instrument, The Banjo In the 19th Century by Philip Gura & James Bollman, published in 1999.